With less than 22 days to go before Ganesh Chaturthi, idol sellers have already set up stalls all over Belgaum. Though prices have gone up 20% to 40%, it has not deterred customers from booking for the festival. But they are opting for a smaller-sized one keeping in mind their festive budget, sellers said. 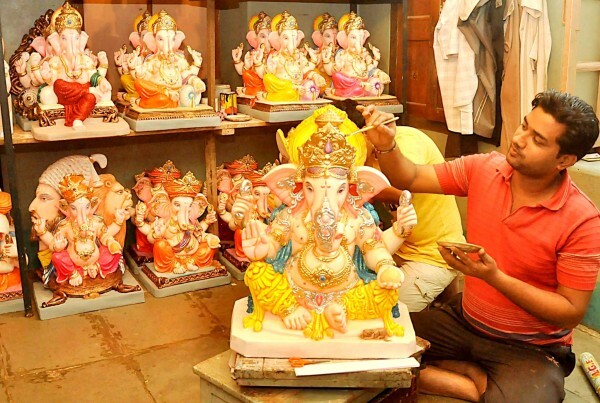 Delayed rains, increased rates of raw material, paint, clay, Plaster of Paris, labour and transport will make devotees feel a pinch their pockets in this year’s Ganesh festival. The work is on in full swing at the workshops with the artists spending even the nights to paint the Elephant God. At most of these stalls, idols are traditional, painted in festive colours of gold and red. The idols which are eco friendly made of pure clay give a deeper pinch to the pocket than those made of plaster of paris. Previous articleMen, on ladies’ seats? Fine!